Thanks to online classes and technology, education is accessible to any student at any place and time. 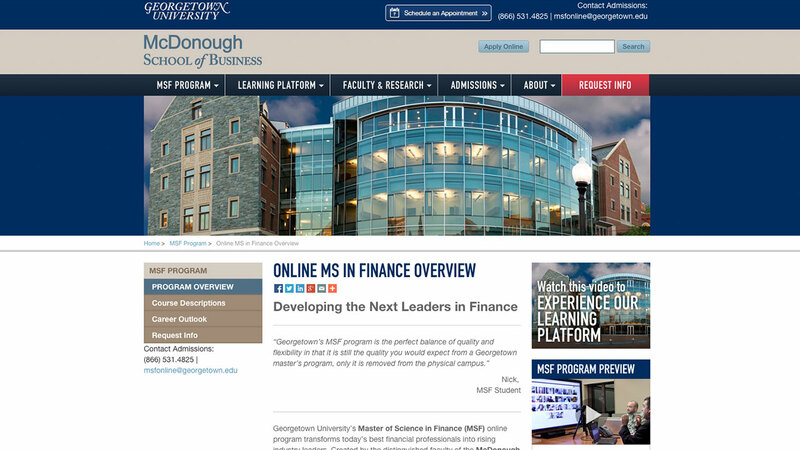 In 2013, Georgetown University’s McDonough School of Business, was launching its first online courses for its Master of Science in Finance online program. TriVision filmed these online courses onsite at Georgetown University, as well as at TriVision’s green screen and white CYC studio in Northern Virginia. The project was part of a year-long collaboration that involved on-campus and in-studio productions. A 10-person team conducted pre-production planning, script consulting, production, post-production editing, and 2D animation work. Georgetown School of Business Sample from TriVision Studios on Vimeo. The program was initiated and led by Deltak which was acquired in 2012 by Wiley, a comprehensive technology company that designs, implements, and supports innovative learning experiences for higher education. These high-impact, long-form, educational lecture videos which became available to students during spring 2014, helped professionals transform into recognized leaders in their profession.